The product Microsoft is touting here is Windows Live Mesh. While this product does offer file synchronization and other cloud based functionality, the feature shown here is remote desktop access. Remote Desktop access to a windows PC has been around for a very long time and has absolutely nothing to do with cloud computing. Casually talking to a non-IT person about this commercial also revealed that it gives consumers the impression that they can accomplish this anywhere without mentioning the need that you need a decent internet connection. I did notice an “Internet required” message at the very end of the commercial in an almost blended manner that you can easily miss it. The product touted here is Photo Fuse from Windows Live Photo Gallery. This feature has nothing to do with cloud computing and I don’t see much of anything here that could not be done by most photo editing software. Posting on facebook does not use the cloud either and even though you can use Microsoft’s cloud based online storage SkyDrive, that is not what is brought to light here. 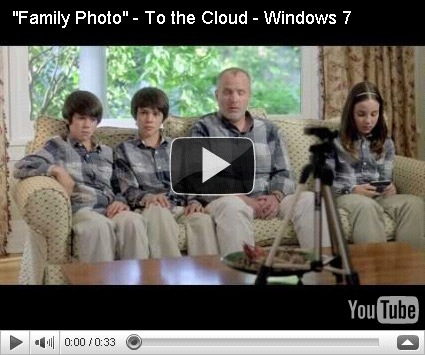 This commercial touts Windows Live Movie Maker that is included in Windows Live Essentials 2011. This product allows one to edit a movie and post it online. Again, this has nothing to do with cloud computing and there are plenty of video editing programs out there that provide the same functionality. The product touted in this commercial is Office 365, Azzure and Hyper V Server. This is the only product in the series that does fully utilize and leverage cloud computing. With Google Apps, Zoho, Amazon EC2, being around for quite some time now, there is absolutely nothing new here. In the end, my gripe with Microsoft is that they are using “cloud computing” as a marketing buzzword and misleading consumers about this concept and technology. My message to Microsoft is simple, don’t mislead and find a different buzz word to show the consumer that you are catching up with other products on the market.